Queens Creek Elementary School in Onslow County recently unveiled a new 5-kW PV solar installation, provided through an NC GreenPower grant program. Funding for the panels was provided by NC GreenPower, the State Employees’ Credit Union, Jones-Onslow EMC, Cypress Creek Renewables, and donations from school staff and families. It is the eighth installation funded through the NC GreenPower Solar School program and the first on electric co-op lines. The school installation includes a weather station, real-time monitoring, an associated curriculum and training for teachers. 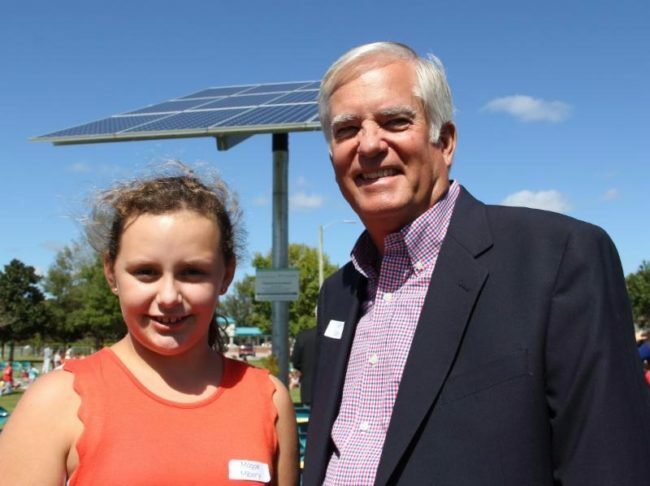 Jones-Onslow EMC CEO Jeff Clark with Queens Creek Elementary student representative Maggie Milbery at the ribbon-cutting ceremony. Queens Creek Elementary School has been an NC Green School of Excellence since 2014, an honor that recognizes K-12 schools in the state dedicated to sustainability. Major components of the roughly $40,000 pole-mounted solar system include 12 SunPower solar modules provided by NC GreenPower, interactive inverters, and an internet monitoring system that provides students with solar irradiation, ambient air temperature, module temperature and other data. The grid-tied array is estimated to produce about 6,570 kWh each year, with a potential cost savings to the school of $657 annually. The panels will provide power to the school library and cafeteria.